On Monday, the unthinkable happened: On a clear Paris evening, Notre Dame de Paris caught fire. 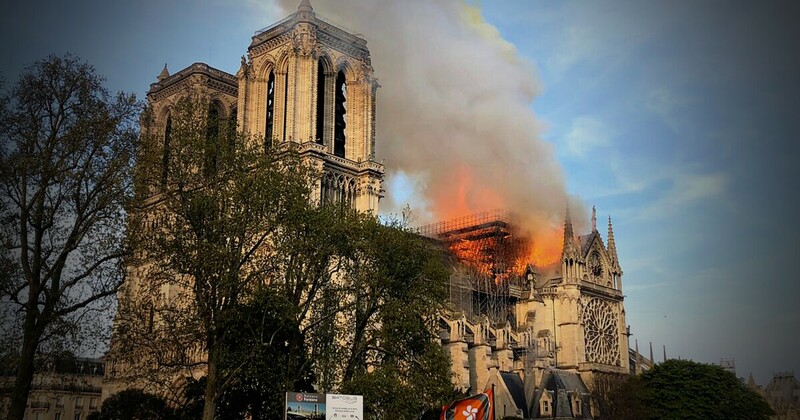 The burning cathedral is one of the oldest buildings in the city of lights and an iconic testament to human art, architecture, and, above all, faith. As millions of people watched on television and in the streets of Paris, the cathedral’s Gothic spire went up in flames before collapsing along with several segments of the roof. Originally completed in 1345, Notre Dame was the result of almost 200 years of work. Since then, it has survived centuries of religious violence, war, and political turmoil. Through it all, Notre Dame remained standing, majestically overlooking the Seine, a quiet witness to the ebb and flow of the city’s history over hundreds of years. In the modern world, for visitors and residents alike, Notre Dame was, and will be, the same breathtaking sight that had greeted previous generations. Its dark interior and brilliant stained glass played off the wooden carvings of the choir screen, and relics set against its soaring stone arches conveyed every bit of majesty its architects had envisioned centuries earlier. Watching flames tear through the cathedral, sending plumes of smoke and ashes billowing into the sky, captivated the world and stirred a deep sense of loss. It is not just a building on fire, but an irrecoverable part of our human past that we will never be able to share with our children or grandchildren. For many, including myself, the immediate reaction to the sight of flames among its famed gargoyles was tears. Notre Dame was a profoundly human accomplishment and its loss is a similarly human one. Weeping for the building is not only understandable but an entirely appropriate expression of the unavoidable and visceral feeling of helplessness brought by the fiery destruction. History is fragile, art is fleeting, and the fire of Notre Dame incomprehensible. The wonder of walking through its medieval doors will never be matched by even the best pictures.